In The Angus Bowmer Theatre at The Oregon Shakespeare Festival, Ashland, Henrik Ibsen's "Hedda Gabler" is a riveting drama of a strong woman who has everything, but never quite believes in herself. That becomes her undoing, especially when she gets trapped in a marriage with someone she has absolutely nothing in common with. The marriage has resulted from an offhand comment she made to George Tesman about how she would like to live in the house they happen to be passing by. George is expecting an appointment to a position and promises her everything, a footman, a thoroughbred horse, select company and social position. She felt her time was up, she had danced herself out, and George would be an important man. George is a total academic. He has one purpose in life, to study books, and rearrange other people's writings. He has been raised by his two aunts, Juliana and Rena, who is now an invalid. He has just returned from a five month honeymoon when the play opens, and he's ecstatic when "Auntie Juju" shows up at their house. They fuss over each other, and she mentions that she has mortgaged their annuity to buy the house for George and Hedda. He has just written a new book on "The Domestic Industries of Brabant in the Middle Ages," and he will surely be able to pay it back. 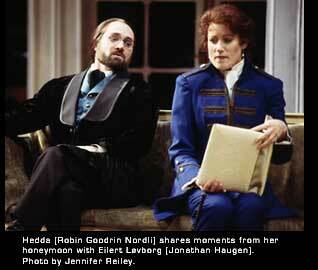 Hedda's father was the late General Gabler. He appears at various times during the play as an apparition, walking silently on the stage to ethereal piano or orchestral music, much of which sounds like Philip Glass' opera "Satyagraha," very other worldly and spiritual. She was always the prettiest, most popular girl, and everybody wanted her. Now she has realized what a mistake she has made, and she's upset, insulting, and detached. George has intimated to Aunt Juliana that Hedda's pregnant, and that sends her into a rage where she pounds her abdomen. The General once again walks slowly across the stage. 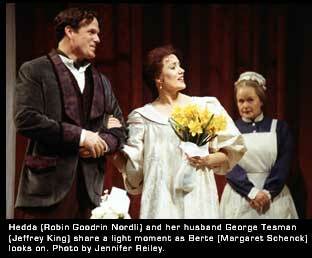 Hedda always calls George, Tessman, never George. She's Gabler, she's the General's daughter, not George's wife, and has not found anything that would make her simply Hedda, her own woman, and Ibsen's original name for the play. She's Hedda Gabler, and that's repeated forcefully at critical moments in the play. Eilert Lovborg has just come out with a new book that is the current rage, "The History of Civilization." This is the first interest Hedda has shown in anything. When the woman heworks for Thea Elvsted comes, she wants information, but gets much more than she bargained for. Seems that Thea has left her husband for Lovborg. There's the shadow of another woman between them, though. The other woman had pointed a pistol at Lovborg the last time they were together. It was Hedda. Thea says Lovborg taught her to think andunderstand all kinds of things, and she helped him with his work. He has reformed himself, and quit drinking and carousing for her. Judge Brack also wants Hedda's attentions and completes the triangle with her and her husband. He tells George that his appointment has run into a hitch. He now has to compete with Lovborg. George is completely distressed. Hedda loves it, until she realizes she can't have anything she wants. She says that at least she still has her pistols. When the Judge enters through the garden, she says she's going to shoot him, and shoots into the air. She's bored to death at the thought of spending all her life with only one person, George, who is only interested in his research. George has gotten Lovborg's book, and says "it's really balanced. He never used to write like that. Lovborg visits and says he only wrote what people wanted to hear. He holds up his new manuscript, which is what he really thought. Thea helped him with it, inspired him, it's like their child. He says he doesn't want to compete with George for the position; he only wants to defeat him in the eyes of the world. He will wait until after the appointment to publish it. He is left alone with Hedda. He repeatedly calls her "Hedda Gabler." She says she's not that anymore, but he says she'll always be that. They discuss their former relationship; they told each other everything. He asks why she didn't shoot him, and she responds that she was afraid of scandal. He says she's a coward. She teases and goads him into taking a drink, then two, then the bottle, before joining George and the Judge at the bachelor party. 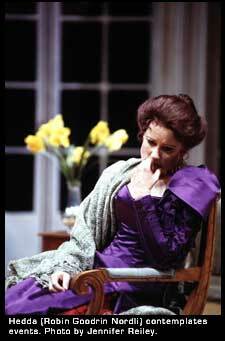 To open the second part, Hedda is spotlit at the front of the stage performing. The General enters from a vom and hands her a bouquet. She turns it around and sees a child's face in it, throws it back, and pounds her abdomen, crying hysterically; the child is her final, complete bond that will imprison her forever. At the bachelor party, Lovborg has gotten drunk, gone to Madame Dianna's den of ill repute, and been banished from all society. He has also dropped his manuscript, which George has picked up and given to Hedda to keep, while he goes to attend his aunts, as Rena is dying. Hedda throws all the furniture around, the carpet, and the room is left barren and battered like her soul. Lovborg forces his way in. Thea has been sleeping in Hedda's room and comes out at the noise. Lovborg says they have to stop seeing each other. He has no future and will not do any more work. Thea says she needs to be with him. Their book needs to come into the world; it's their child, mine, too. Her soul and heart were in that book, and she can't see anything ahead, only darkness. When they're alone, Lovborg tells Hedda he lost the manuscript and he wants to end it, the sooner the better. They embrace, and she gives him a pistol. When he leaves she burns the manuscript in the fireplace, "I'm burning your child, Thea, you and your beautiful curly hair." Aunt Rena has died. All are in black as Hedda plays Chopin's "Funeral March." When Aunt Juju implies the joy of Hedda's coming child, she pounds harder. George is furious and scared when Hedda tells him she burned the manuscript. She says she didn't want Lovborg to overshadow him. She calls him George for the first time. The play rises to a crescendo as Thea thinks Lovborg has been shot. The Judge says he is dead, shot himself in the breast. George and Thea dedicate themselves to reconstructingthe manuscript. They go off happily together leaving Judge Brack with Hedda. She says Lovborg has done something beautiful. He had the courage to leave the feast of life. The Judge says he was really found in Madame Diana's boudoir. He was "shot in the stomach, somewhat lower." He had gone there looking for the manuscript he claimed they had stolen. Hedda asks "What curse is it that makes everything I do seem ludicrous and mean?" This is underscored as the General makes his way across the stage with a bouquet of red roses, as Hedda puts the pistol in her mouth, pulls the trigger, and falls dead. Her body is covered with the roses. George and Thea exclaim, "She's shot herself in the head." 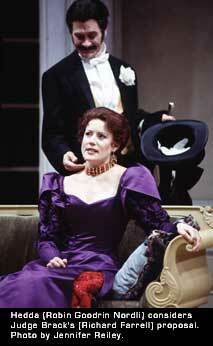 Judge Brack says "People don't do such things" in this riveting climax to Henrik Ibsen's "Hedda Gabler." This world premiere translation br Artistic Director Emeritus, Jerry Turner continues in the Bowmer Theatre at The Oregon Shakespeare Festival, Ashland through November 2.